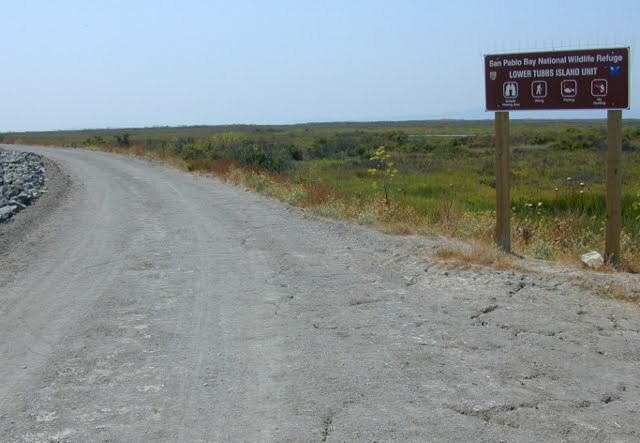 Most folks drive through the fringes of the San Pablo Bay National Wildlife Refuge without even realizing it -- CA 37 (aka Sears Point Road) runs through the southern part of this Sonoma County refuge. There are few public access points and the dizzying speed of traffic on CA 37 hardly encourages drivers to slow down and look for a trailhead. SP BNWR is managed by the federal government, which is currently engaged in a cleanup at Skaggs Island, a former naval reservation situated between CA37 and CA121 (Sonoma Highway). Part of their plan is to purchase a 1,100 acre hay farm which an article in the SF Chronicle claims occupies 1/4 of Skaggs Island. The feds say the farm (and the rest of Skaggs Island) should be restored to wetlands; the farmer says the land is his family heritage, and he just doesn't think the monetary compensation is great enough. But then he is quoted as saying he wishes to pass the farm to his son, so who knows if he really wants to sell. Until this situation is resolved, Skaggs Island will remain dry. These wetlands of San Pablo Bay are perhaps best suited to exploration by boat -- launch from the Vallejo public marina near Brinkmans Marine or at Port Sonoma near the Petaluma River and wind your way through the sloughs teaming with wildlife. To get a taste of the wildlife refuge on foot (access for hikers is quite limited) check out Lower Tubbs Island, at the southern tip of the refuge. Choose a cool day (there is no shade) and be sure to bring binoculars for bird watching. It's an 8 mile totally flat hike with outstanding views of Mount Diablo and Mount Tamalpais, and offers a rare opportunity to stand right on the (here pristine) northern shore of San Pablo Bay. When I hiked here I saw many birds, a hawk eating a jackrabbit, snakes, and butterflies. And not one other hiker! The Tubbs Island Trail is good when conditions are dry, but if conditions are even slightly wet there will be sticky mud that makes hiking or biking very difficult. Birdwatchers will want to go there at low tide to see birds feeding on the exposed mudflats. 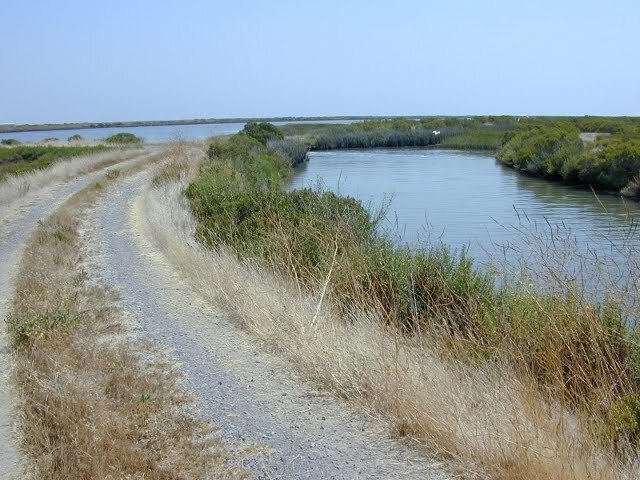 Tubbs Island Trail Hiking Trail at San Pablo Bay National Wildlife Refuge - BRT Insights 26nov2011.